There are several types of Leliveld main waterline Water Vitalizers for the entire house, office or other situations where water is being used. Water that flows in nature is vital by nature, its structure is not affected. The water we drink from the tap has been pumped up under high pressure, pumped through the water system through straight water pipes and hook shaped corners, passing by many electromagnetic fields, affected by light and filters, in short, it has undergone all kinds of not natural influences. This harms the natural structure of the water. The Leliveld vitalizer, placed in your main water line behind the water gauge gives the water its natural structure and vitality back. 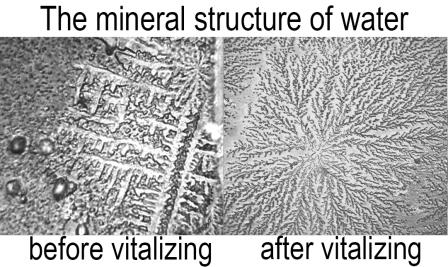 Vitalized water shows its organised structure once again. This organised structure can be found in all of nature, for example in a fern leave (see image in top right). Besides this, the minerals in the water are properly distributed and used better. The water regains live force, harmony and softness. Because of this, water-vitalization is the base of healthy drinking water. On this page you can find more pictures of water structures of vital and charged water. The vitalizer has a geometrical shape from stainless steel which is informed with frequencies/vibrations of natural glacier water as in nature. These frequencies are sent out to the water that flows through the house via the water pipes. The effect is a field of energy that feels calm and peaceful. This energy is of staying value for everything that lives. Through it, the earth, the water and the work and living environment of human beings reach a state of harmony. By using vital water, substances that are foreign to the body and stress can be removed much quicker. A main water line vitaliser doesn't only vitalize the water and house, but through the frequencies it's emitting it also influences the energy of the entire area. This causes a positive influence in the wellbeing of humans, animals and plants. Why use a main water line vitalizer for the entire house? To ensure that all the water in your house has a high quality. To create a better connection between the people in the house/area. To feel more at ease in your house. To increase living from your emotion. To increase living in the moment. If the energy in your house feels heavy or uneasy and you have the feeling that 'something' is weighing down on you. To increase the atmosphere and to live in an environment that is harmonious and that encourages growth of awareness. To create a better connection between your house and the nature around it. To turn your house into a place where you can rest. The vitalizer and all other Leliveld products are quality products. 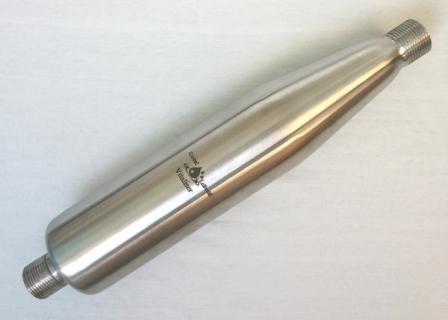 They are safe, stable and solid and are made of high grade stainless steel. The energy of the vitalizer is safe, i.e. it will always adapt to the personal process of development that you are already going through. By using the vitalizer, the water becomes healthier and you will automatically start drinking more water. By drinking more water, you get in touch with your emotions and you will act on intuition more and more. The energy of these tangible products will be absorbed by the body, which is why it is important to make a conscious contact with the product. The information of the vitalizer encourages that your energy and the energy that you live off of will flow better. Vital water is wonderful to shower with. It transforms the harmful radiation in the water. The water vitalizer doesn't need to be charged and doesn't require any maintenance. 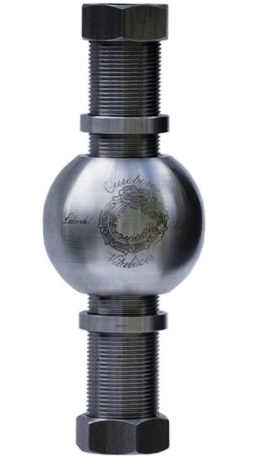 Click here for all specific advantages of a (main water line) water vitalizer. Click here to read experiences with the main water line vitalizer. Information about the optimal combination of water treatments to ensure the best drinking water, such as de-calcification, filtering and vitalising. The unique frequencies that the Leliveld vitalizer emits also work, through the water, on the balance of all organs for the physical wellbeing of the human in its entirety, on all levels. Moreover, the power of the vitalizer also gives a strong improvement of energy in general and, if you use a main water line vitalizer, it even improves for the entire house and its environment. Transferring specific frequencies is a very specialist aspect of vitalizing water, which realizes a much deeper and powerful effect than through water vortexes , charging through crystals or other methods. How do I choose which vitaliser to use? We recommend to see to which vitalizer you are attracted most. Your first choice is usually the right one. You can also see if there is a certain vitalizer that 'sticks to you' after you've seen all different types. Of course, you can also always ask us for advice for your specific situation. Placement: the vitalizer is placed in the main water line, behind the water gauge (preferably perpendicular to the earth, with the broad side as the side where the water flows in and the small side where it flows out on top) or on, for example, your pond pump. In your house or office it will vitalize all water. We advise to have the vitalizer installed by a skillful local plumber. Because we have faith in our products and only want completely satisfied customers, we offer a five year guarantee on the functionality of the vitalizer. Besides that, we offer a one year satisfaction guarantee if you are not satisfied with the product. For the installation of a main water line vitalizer, you can choose to ask for a water sample, so that you can get a clearer idea of the vitality of the water. We make a photograph of the mineral structure which shows how the water is currently organized. Three months after the vitalizer is installed we again photograph the structure to provide a new sample, showing you the difference in the structure of the water. You can find more information in this pdf. The vitalizer can be combined excellently with a water filter for the entire house or a water filter under the sink in the kitchen. If the quality of the water pollution wise is already acceptable a vitalizer alone will do it. 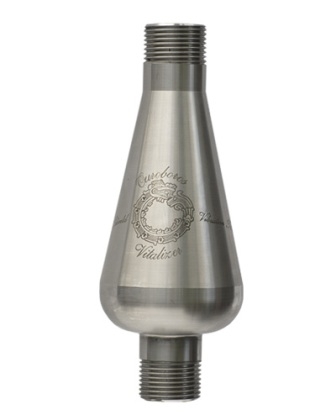 Size: 1 thumb (28 mm), can be connected with adapters on 22mm and 15mm water lines. You can fill out our price quotation form and we will be in contact with you about a fitting offer. If you have any concerns, we are always happy to talk to you and answer any specific questions. 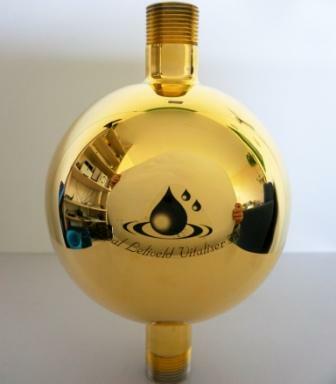 This gilded vitalizer, shaped like a half a ball, helps people to feel more connected to themselves and each other and is very helpful when someone is very sensitive. This gilded vitalizer is a combination of the Ouroboros and the Oriente d'Oro. This vitalizer connects the human on all levels to the earth, in a strong and even way. The gilded layer ensures that the vitalizer has an extra powerful, though soft, transforming function. 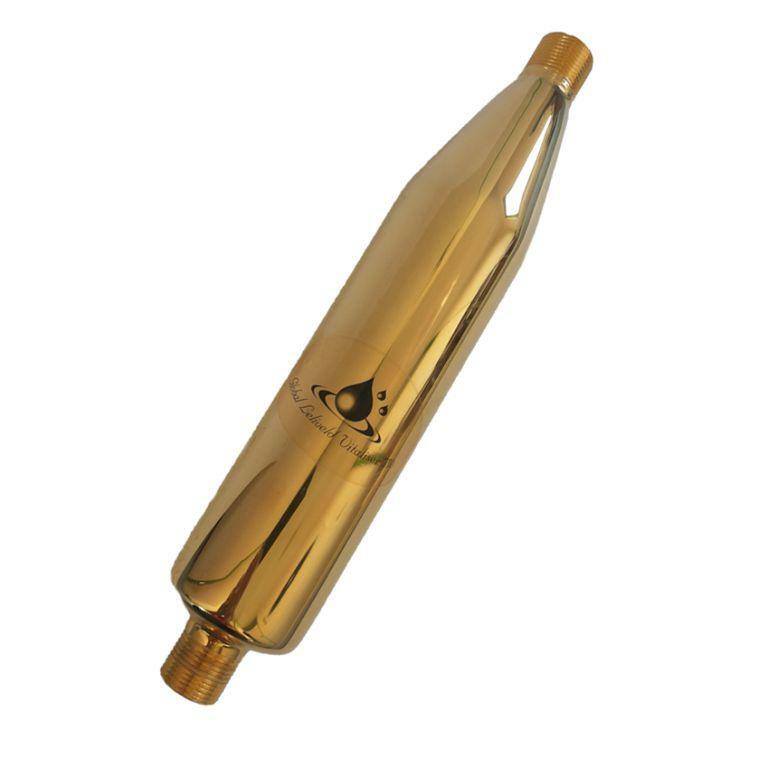 This Golden Globe watervitalizer is specifically suitable for spiritual centers and situations where people (want to) make contact with each other from the heart. The globe is equivalent to the Earth and activates a consciousness of unity in which the feeling of separation has disappeared. The watervitalizer can also be placed at companies where a shift from power and will power to relaxation and cooperation is needed.